We produce the finest quality Christmas turkeys by carefully selecting slow growing breeds that reach full maturity naturally. All our turkeys have plenty of space to run about in and enjoy natural daylight. From late summer our Free Range Turkeys (Bronze and White Turkeys) live in large airy barns that open on to green downland fields. Every day they explore their natural surroundings pecking at the grass and bales in the fresh air. Meanwhile our Traditional barn reared white turkeys live in spacious straw bedded barns. Our Traditional Free Range bronze and white turkeys are fed on our home grown cereals. This is all milled on the farm. No growth promoters are ever added to the food. 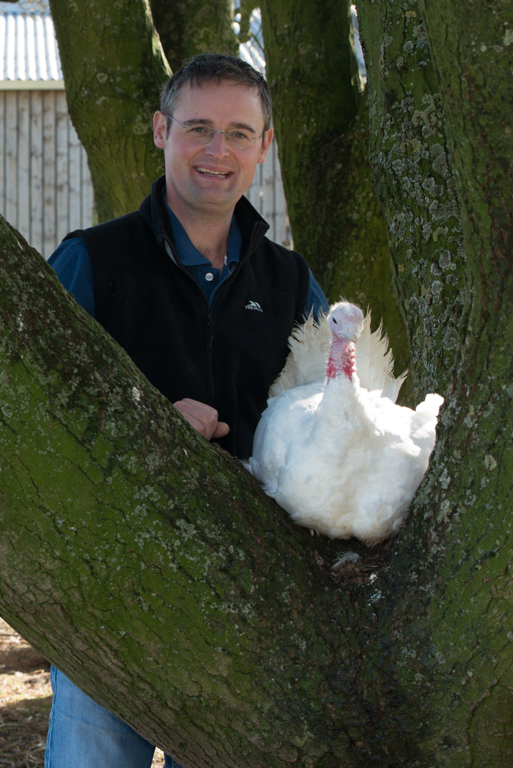 The Organic Turkeys are reared in exactly the same way on a local organic farm, and fed on high quality organic feed. We are one of the few Organic Turkey producers in the country that hang and dry pluck their turkeys in the traditional way. We believe our turkeys are full of flavour and very moist due to the traditional methods used to prepare the turkeys. We dry pluck all our turkeys and they are hand finished (this includes the the wing tips which we do not chop off) and then they are hung for at least 7 days in refrigerated storage rooms. The turkeys are then dressed in our purpose built preparation area. The turkeys in the supermarket are not the same. Your turkey will be ready for the oven, with a free pop-up timer and a sprig of rosemary. The Pop-Up ® helps you to cook the turkey to perfection. Simply insert it into the Turkey before cooking and when it’s ready it will pop up.